I made these in lieu of a birthday cake for my father-in-law’s birthday dinner. I made the shells a day in advance and warmed them back up in the oven just before serving, making them quick and easy when we were ready to eat them. Preheat oven to 425 degrees with a rack in the middle position. Butter a couple of baking sheets. Add butter, water, and salt to a small saucepan and bring to a boil, stirring until butter is melted. Reduce heat to medium and add flour. Beat constantly with a wooden spoon until the mixture forms a ball and pulls away from the sides of the pan. This should take about 30 seconds after you add the flour. As soon as this happens, remove from heat and transfer the mixture to the bowl of a standing mixer. Allow to rest for 3 minutes or so. Add the eggs, one at a time, while beating at medium speed. Once they are all well combined, use a pastry bag or spoon and form 27 mounds on the baking sheets. Bake until puffed and golden – about 20 – 25 minutes. Do not open the oven door while cooking. 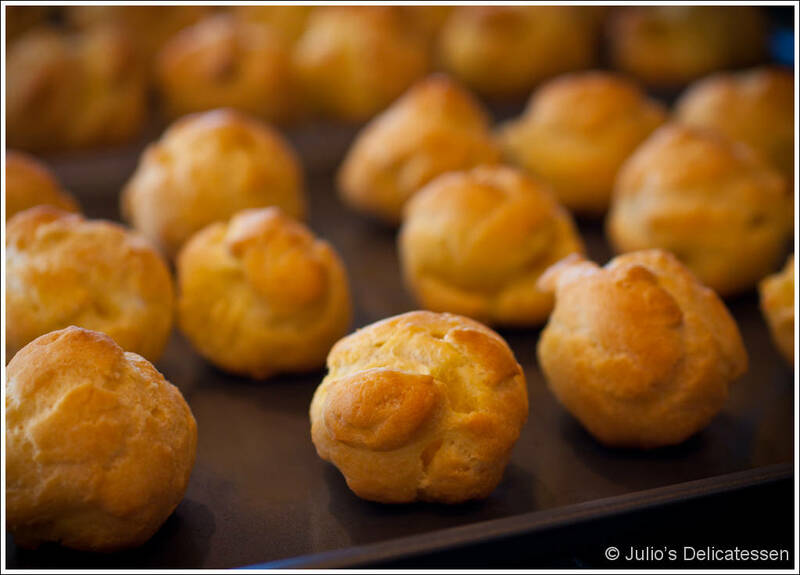 When they are done, poke each profiterole with a wooden skewer, then return to the oven for another 2 – 3 minutes. Make chocolate sauce. Combine cream and butter in a small saucepan over medium heat. Heat until bubbles appear at the sides, then quickly remove from heat and add chocolate, vanilla, and Cognac. Stir until the chocolate is melted and the sauce is smooth. 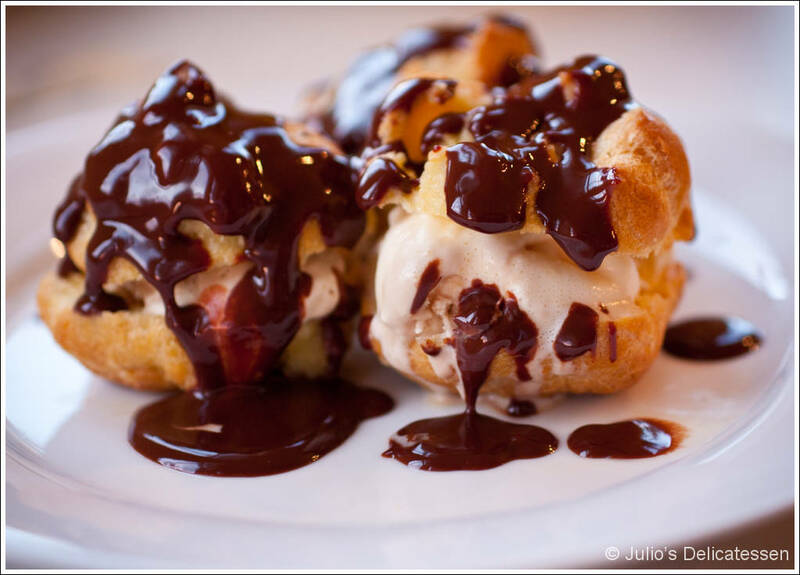 Use a serrated knife to cut each profiterole horizontally. Add a small ball of ice cream to each one. Arrange three on a plate and drizzle with chocolate sauce.